I have a goal to ride my bicycle across Canada. I have decided to take two weeks each summer and ride a 1000 mile stage. 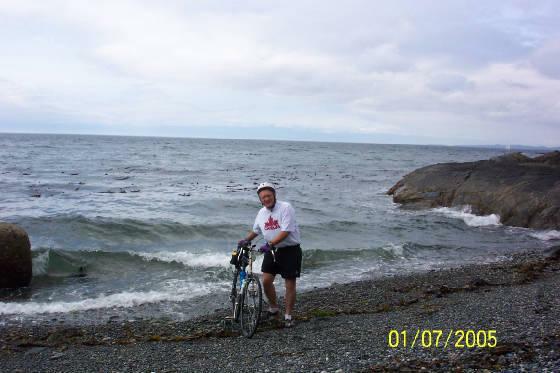 I will start on Vancouver Island and ride back to Magrath this year. 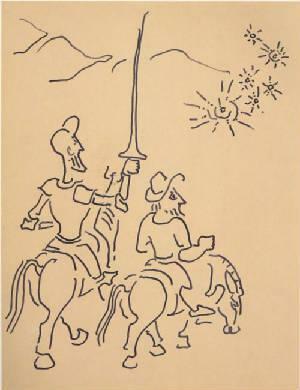 I identify with Don Quixote. It is great to have and follow a dream. 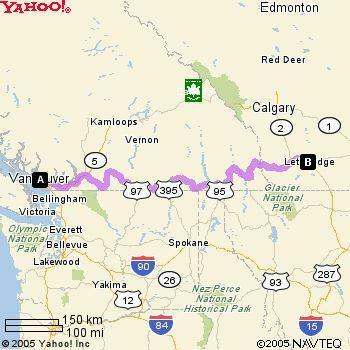 Here are the statistics of my ride from Victoria to Magrath. The map above shows the route starting in Vancouver but we actually took the ferry across to Vancouver Island and I rode from Victoria to Nanaimo as the first day. I will put this information up for now and then add pictures and text as I have the time to do it. 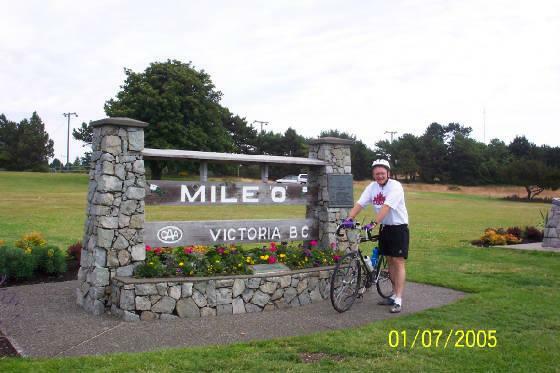 This is Mile Zero in Victoria British Columbia. I started at about 11:00am Friday morning July 1st. I dipped my back tire in the Pacific Ocean and then set off. 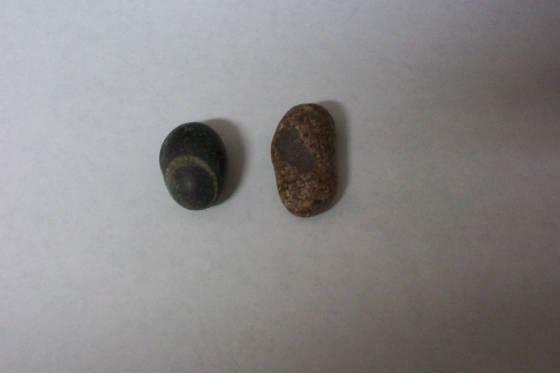 These are two stones I picked up on the beach at Victoria. The one on the left has a circle shape which makes me think of Mile Zero. The one on the right is the one I will put on the beach when I reach Saint John's Newfoundland. This was our first campsite once I started to ride. 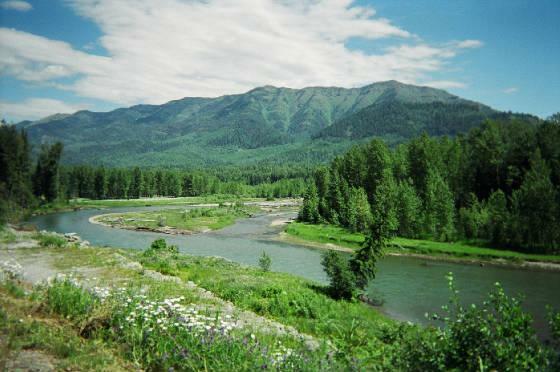 Most of our campsites were similar to this. We were usually able to find campgrounds with hot water and showers. 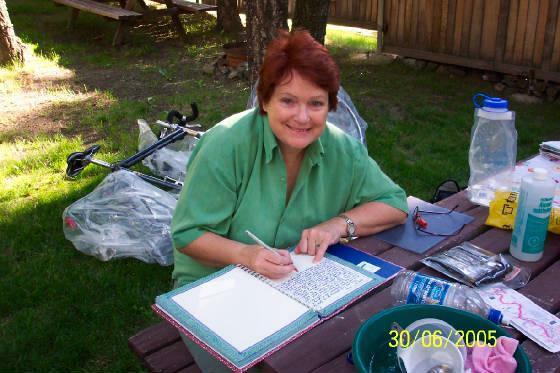 When Lesley was not behind the wheel of the car, she was able to draw and write in her journal of the trip. This is my friend Travis. 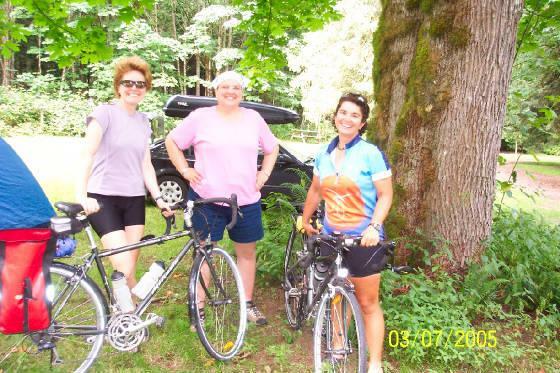 We met after I rode over the Second Narrows Bridge in North Vancouver. I had planned to ride the Trans Canada to the bridge and then connect with highway 7. However, an RCMP officer informed me that much of the Trans Canada is closed to cyclists. I had to ride through Vancouver but once I was over the bridge I was on a bike path and couldn't see any signs for highway 7. 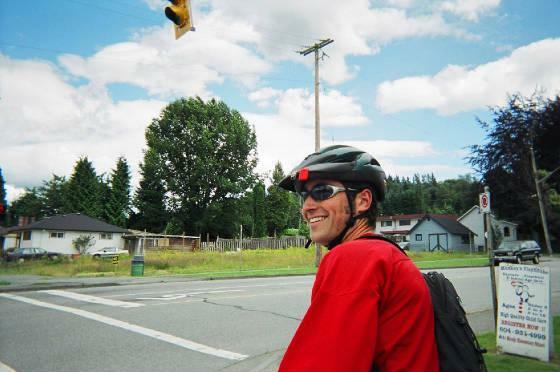 Travis came along and was headed home to Chilliwack by way of highway 7. 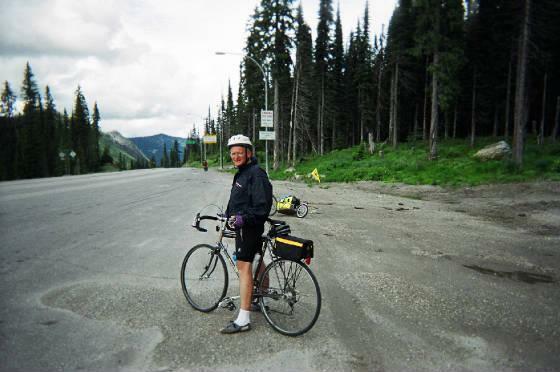 We rode together for about 40 kilometres before he had to take a ferry across the Fraser river. He really helped me find my way away from Vancouver. 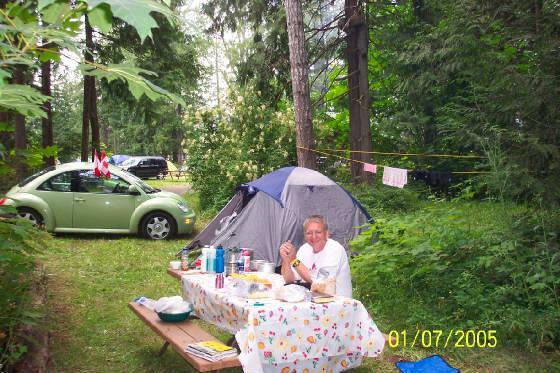 I met France, Sonia and Lise at Lake Errock which is just a little bit east of Mission, British Columbia. 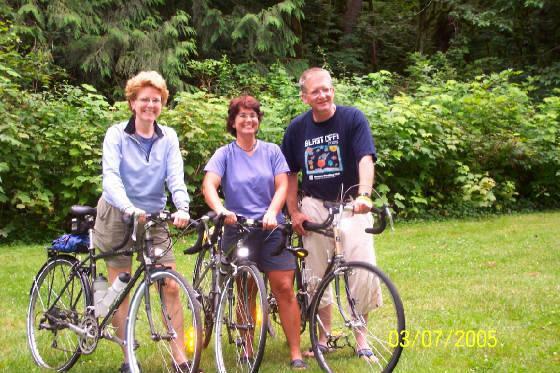 France and Sonia had cycled from Rouyn in Quebec to Winnipeg where Lise, France's sister met them with a car. They drove out to Vancouver and then started their ride back to Winnipeg. Lise drove the car, carried equipment and found campgrounds etc. Her job was to drive the support vehicle like Lesley. We had a good visit in French and English. That was one of the surprises for me. I had the opportunity to speak French quite a few times as we met several groups of cyclists from Quebec who were riding across the country. We traded email and website information and I have been following their progress across the country. 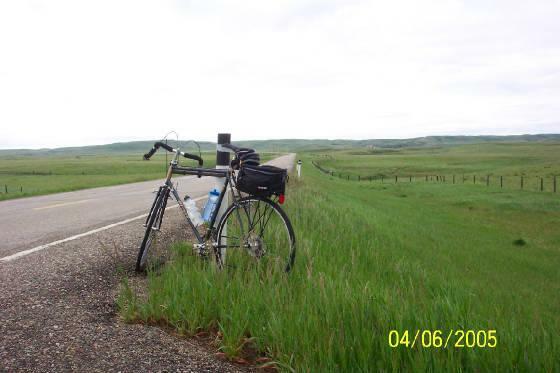 I was quite shocked to read that 10 kilometres from Winnipeg a truck drove too close to them and hit Sonia's saddlebag. This made her fall onto the shoulder of the road. She broke three ribs, her collar bone, her jaw and cracked a vertebrae in her neck. They finished their last bit of the trip across Canada in an ambulance. I am very relieved to read that that with time, Sonia should recover completely from this accident. It is a pity to bike so far and then finish off this way. France says on their website that Sonia would say. "What doesn't kill you makes you stronger." Maybe this is the way Sonia sees her situation. France, Sonia and DeVar at Lake Errock British Columbia. 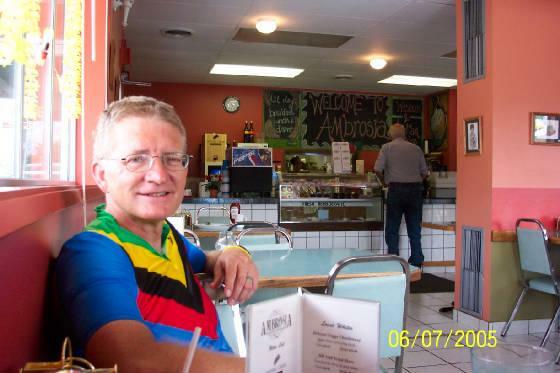 This is my friend Gord from Regina, Saskatchewan. 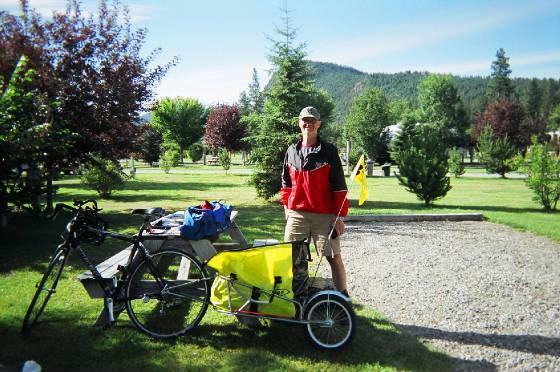 We met the day both of us cycled from Keremeos to Kettle River. It was probably the toughest day of the trip as we had to ride up and over Anarchist Mountain . From Osoyoos to the summit of Anarchist is 22 kilometres of steep mountain road measured in countless switch backs. We camped in the same campground and met in the laundry facility. 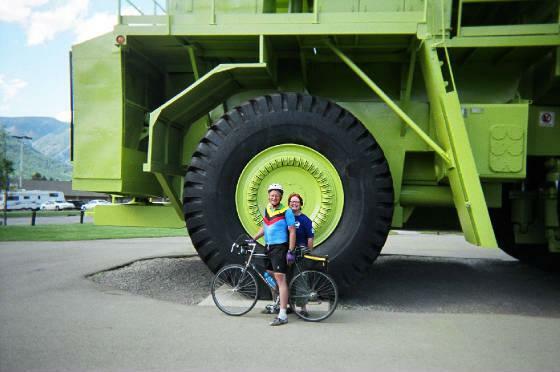 We seemed to bump into each other (not literally) every so often and so we camped together and on my last cycling day we rode from Blairmore to Lethbridge together. I admire Gord for being completely self sufficient. Where I had Lesley to drive a car and carry our stuff Gord had a Bob trailer and carried all his stuff with him. This is Gord coming up to the summit of Paulson Pass. 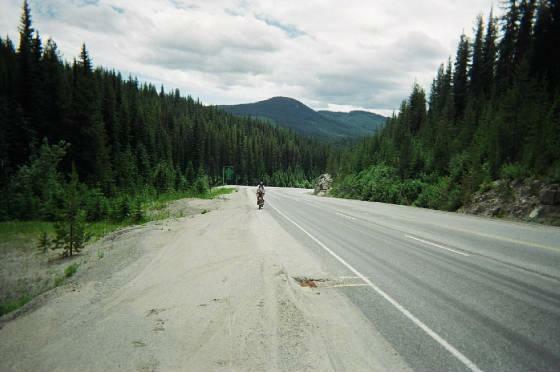 I snapped the picture to see if it would show the steepness fo the road and in some way be a reminder of the the satisfaction of reaching the summit of one of the seven passes that we rode over on Highway 3. While Gord and I were at the summit of Paulson Pass we took pictures of each other by the summit sign. 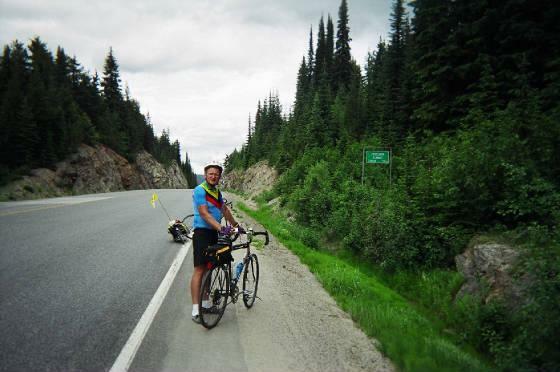 This is at the top of Kootenay Pass, the highest mountain pass in British Columbia. It took several hours to get to the top and about twenty minutes to go down the other side. It was a little rainy and cool but that was not too bad for a summer ride in the mountains. 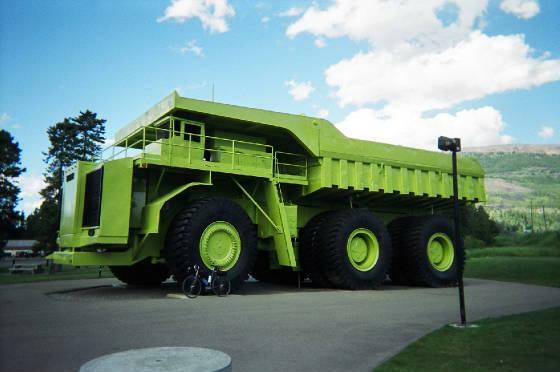 The biggest truck in the world is in Sparwood British Columbia, if the sign tells the truth. I leaned my bike up against it to see the contrast and Lesley and I posed in fromt of it for a picture. What a difference between the two types of vehicles! 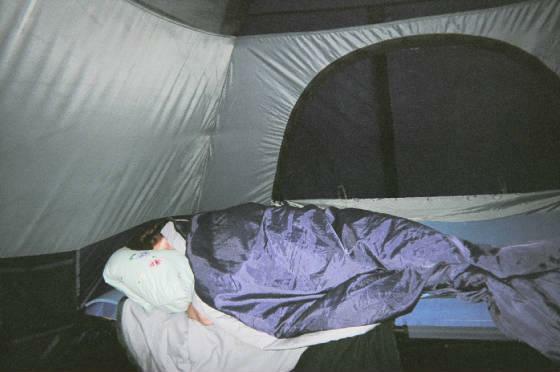 Lesley says she has never slept so well on a camping trip. A cot, an air mattress, a foam pad and a good sleeping bag were nearly as good as our bed at home. Columbia. It was wonderful to ride along beside it. Bicycle speed allows you to really take it in. This picture takes me back every time I look at it..